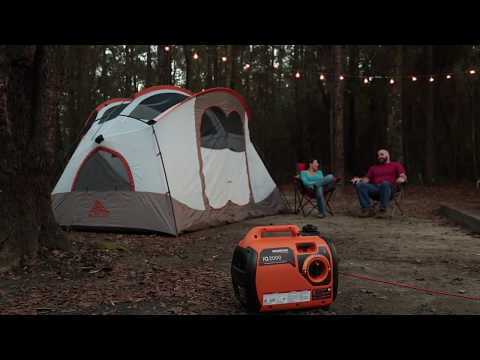 Need power for your next camping trip? Or how about the tailgate event of the year? Generac has you covered. Introducing the Generac IQ Series Inverter Generator. Portable with reduced weight and size. But the same great power. It's True Power technology makes it capable of safely powering sensitive electronics while still easily portable. Here is a visual look into the Generac iQ2000 Inverter Generator. Learn about the features, benefits and many uses of the product that make it innovative. Take a look! STARTUP ESSENTIALS AT YOUR FINGERTIPS. The new, lightweight iQ series portable inverter generator lets you bring power wherever life takes you. From tailgating parties to camping trips and beyond. Find out why packing an inverter generator for your next expedition is a smart move. It’s compact design has a built-in handle for easy portability. Monitors and displays the power being used at the moment so you’ll always know how much capacity you have. Generator Status Indicators alert you to low fuel, low oil, overload and overheating. Display ready, low oil, overload and overheat alerts. Select Turbo, Standard or Economy mode. Connects two iQ2000 inverters generators for twice the power (sold separately). You have the power right at your fingertips. Other features of a Generac inverter generator include a PowerDial, quiet power and status indicator. So, get out, enjoy your adventure, and be in charge of your power. Integrates start/run/stop functions into one simple dial. Generac uses a different type of alternator than standard generators. Engine speed varies depending on electrical demand – which significantly reduces noise levels. Where Can I Buy an Inverter Generator?